The following profiles represent a partial list of some of the major players in Afghan political society. U.S. attitudes toward these power brokers and ex-warlords have been ambivalent at best, and some actors have been alternatively embraced and pushed aside. The Obama administration will have to contend with Afghanistan’s entrenched power brokers and former warlords regardless of which strategy it pursues for the country. However, any strategy must recognize how counterterrorism cooperation with these figures works at cross purposes to the simultaneous efforts to build a state capable of resisting the Taliban insurgency. Fahim served under Commander Ahmad Shah Massoud in the battle against the Soviet Union during the 1980s, and he was appointed Minister for National Security by President Burhanuddin Rabbani following the mujahadeen’s seizure of Kabul in 1992. Fahim was accused of having a role in the massacre of Shiite Hazaras and other rival groups during the battles in Kabul throughout the early 1990s. Fahim served as the intelligence and security chief for Massoud during the fight against the Taliban in the late 1990s and succeeded him as military commander of the United Front following Massoud’s assassination in 2001. He was appointed Defense Minister of the Afghan Transitional Administration in 2002, and replaced 15 ethnic Tajik generals with officers from the Pashtun, Uzbek, and Hazara ethnic groups. By 2002, the C.I.A. had evidence that Fahim was involved in Afghanistan’s drug trade. That same year an investigation of housing rights in Afghanistan by a representative of the United Nations Commission on Human Rights found that Fahim was illegally occupying land and recommended that he be removed from his post. Fahim remained defense minister until 2004 and was briefly a running mate to President Karzai as first vice president in that year’s general election. Karzai eventually dropped him from the ticket as a result of significant pressure from the international community. 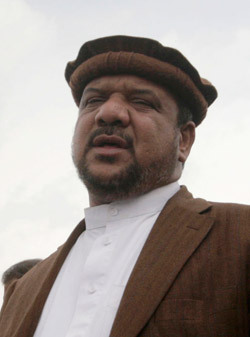 Fahim became a founding member of the United National Front, formed as a parliamentary bloc to oppose Karzai. Karzai once again chose Fahim as his running mate for the presidential election in 2009, a move that was both publicly and privately criticized by various international diplomats, including Secretary of State Hillary Clinton. 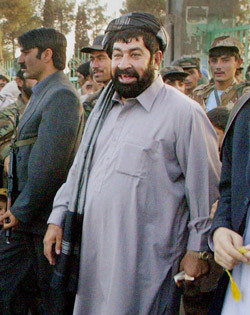 Gul Agha Sherzai served as governor of Kandahar from 1992 to 1994 and from 2001 to 2003. He currently serves as governor of Nangahar province. Sherzhai cooperated closely with U.S. Special Forces based in the area during the early years of the Afghan campaign, providing base security and local intelligence. Yet as governor of Kandahar, Sherzai allegedly extorted large amounts of money from civilians at police checkpoints, embezzled reconstruction money, and ran protection rackets for opium traffickers. U.S. officials estimate he has a net worth of $300 million after running Kandahar. He has also been accused of murdering and torturing rivals. Sherzai has been touted as a success in Nangahar, where he has markedly reduced poppy cultivation and worked with U.S. forces and tribal elders to create relative security and prosperity. Yet some reports suggest that Sherzhai retains controlling interests in poppy farms in the Kandahar area. Sherzai was mentioned as a potential presidential candidate in the 2009 elections, but dropped out to support the incumbent President Karzai. Ahmad Wali and Mahmoud are President Hamid Karzai’s younger and older brothers. They returned to their native country in 2001 after living in exile in the United States. Neither fought in the anti-Soviet campaign in the 1980s. Ahmad Wali Karzai served as a representative for southern Kandahar province, where the family’s Popalzai Pashtun roots lie, in the 2002 and 2004 loya jirgas. 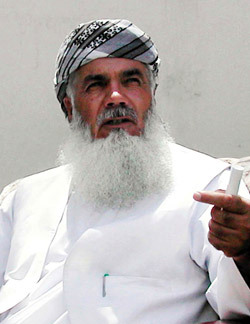 In 2005, he was elected head of the Kandahar provincial council. Ahmad Wali is widely reported to be involved in the heroin trade and to have used his position on the provincial council to protect traffickers aligned with him. He is also reported to have been involved in large-scale election fraud in Kandahar to benefit his brother during the 2009 presidential elections. Karzai maintains that the charges are political in nature and aimed at tainting his brother by association. October 2009 reports in the New York Times indicated that Ahmed Wali received money from the CIA over the past eight years to assist in counterterrorism operations in the Kandahar area. He is reported to have acted as a broker with Taliban insurgents, organized a paramilitary strike force for the CIA in Kandahar, and assisted in securing Taliban commander Mullah Omar’s former home to serve as a facility for intelligence operatives in Kandahar. Mahmoud Karzai retains a residence in Maryland and managed the family’s string of Afghan restaurants in the United States prior to the fall of Taliban. He currently heads the Afghan Chamber of Commerce. He has been accused of profiting through this position and his family connections, and holds interests in mining, a cement factory, the country’s dominant bank, and its only Toyota distributorship. Hamid Karzai has refused to take action against either brother, saying he has received no evidence, only allegations, against his family members. 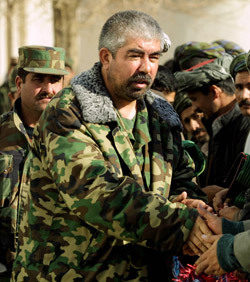 Dostum continues to politically dominate the Uzbek region in northern Afghanistan as leader of the Junbesh-e-Milli-Islami (Islamic National Party). He was not a formal member of the interim government, however, and received only 10 percent of the vote when he attempted to run for president in 2004. Karzai later appointed Dostum as the country’s Deputy Defense Minister and chief of army staff, a largely ceremonial post. He was removed from that position and left for Turkey in unofficial exile in 2008. Dostum returned to Afghanistan to endorse Karzai in the 2009 presidential election. Ismail Khan served as an officer in the national army prior to the Soviet invasion in 1979. He joined the Jamiat-e-Islami mujahedeen faction and fought against the Soviets until their withdrawal a decade later. Khan served as governor of Herat from 1989 to 1995, when the Taliban ousted him. He was jailed by the Taliban in 1997 but escaped in 2000. Khan drove the Taliban out of Herat in 2001 as a leader in the Northern Alliance and returned to his role as governor. Khan was accused of human rights abuses, including systematically harassing ethnic Pashtuns, and withholding provincial revenues from the central government during his term as governor under Karzai. President Hamid Karzai ousted Khan from his office in 2004 following clashes with local rival Amanullah Khan—a Pashtun and no relation—but subsequently appointed him Minister of Energy and Water, a position he still holds today. Khan continues to exert considerable influence in Herat and the western region. His son, the minister of civil aviation and tourism, was assassinated in 2004 and Khan has been the subject of three assassination attempts himself. Khan supported Karzai’s reelection efforts but threatened to quit the cabinet if security in western Afghanistan was not improved following the most recent assassination attempt in September 2009. 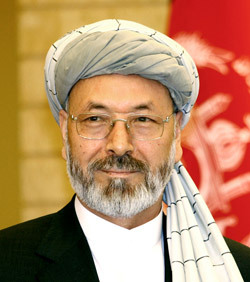 Mohammad Karim Khalili is the current second vice president of Afghanistan and a member of the ethnic Hazara Shiite minority from the central province of Wardak. Khalili was a member of the Hizb-e-Wahdat Islami Afghanistan, or the Islamic Unity Party of Afghanistan, a Hazara militia group led by Abdul Ali Wazari and said to have maintained close ties to Iran prior to the American invasion in 2002. Khalili served as finance minister during the interim mujahedeen government during the civil war period, where Wahdat clashed with other factions for control of Kabul, and was accused of intentionally killing civilians. Wahdat was, aside from the Northern Alliance, the principle armed opposition group to the Taliban during that movement’s take-over of the country, and Khalili assumed leadership after Wazari was killed by the Taliban in the early 1990s. Khalili served as the Hazara community’s representative as vice president during the interim Afghan government from 2002 to 2004 following the U.S. invasion, and was a member of President Karzai’s ticket as second vice president in both 2004 and 2009. Among other duties, he has served as head of the Disarmament and Reintegration Committee, which formally manages the Disbandment of Illegal Armed Groups process. Atta Mohammad Noor fought against the Soviet invasion in the 1980s and against the Taliban regime in 2001. He commanded some 20,000 troops as part of the Northern Alliance, seizing the city of Mazar-e-Sharif during the fall of the Taliban. He had close ties with Afghan Defense Minister Mohammad Qasim Fahim, since both were members of the Jamiat-e Islami mujahedeen faction. But the two warlords became rivals after defeating the Taliban, commanding their militias to repeatedly engage in hit-and-run battles that have led to instability in parts of five northern Afghan provinces. Noor has served as the governor of Balkh Province since 2004. He publicly denounced the corruption within the Karzai government during the 2009 presidential campaign and endorsed challenger Abdullah Abdullah, the only sitting governor to do so, after he was passed over for a vice presidential position on Karzai’s campaign ticket. Abdul Sayyaf is a former mujahedeen leader who was based in Peshawar, Pakistan for much of the conflict against the Soviet Union. He established the Ittehad-e-Islami (Islamic Unity) party with the support of Saudi Arabia in 1980 in order to mobilize Arab volunteers and money for jihad. Sayyaf formed a relationship with fellow jihad supporter Osama bin Laden in the 1980s and established several training camps in Pakistan and Afghanistan for foreign fighters. These camps continued to operate after the Soviet Union’s withdrawal, and the Abu Sayyaf group, a terrorist group in the Philippines, takes its name from him. Ramzi Yousef and Khalid Sheikh Mohammad, the masterminds for the first and second attacks on the World Trade Center in 2001, are also said to have attended training at camps operated by Sayyaf. During the Afghan civil war following the Soviet withdrawal, Sayyaf’s group aligned with Commander Ahmad Shah Massoud against fellow Saudi client Gulbuddin Hekmatyar. Sayyaf’s forces were accused of multiple human rights violations during this period, including the massacre of Shiite Hazaras in Kabul. Sayyaf opposed the Taliban movement in the late 1990s and fought alongside the Northern Alliance against them, one of the few Pashtun leaders to do so. Following the collapse of the Taliban regime, Sayyaf participated as a member of the constitutional jirga in 2002 and was influential in placing religious conservatives on the newly established Supreme Court. His party was renamed the Islamic Dawah Organization of Afghanistan in 2005, and Sayyaf is currently a prominent figure in parliament, where he has sought to bar the prosecution of former mujahedeen for war crimes. He endorsed President Karzai’s reelection campaign. Sher Mohammad Akhundzada is the son of a former mujahedeen commander and governor of Helmand. He lived in exile during Taliban rule with future president Hamid Karzai in Quetta, Pakistan, where they became close associates. President Karzai appointed Akhundzada governor of Helmand Province following the removal of the Taliban. Akhundzada claims credit for keeping the province free of Taliban attacks during his time in office, but he was infamous for his reported ties to the opium trade, Karzai removed him from office in 2005 under pressure from the international community. Karzai has cited Akhundzada’s removal as a cause for the Taliban’s recent successes in destabilizing the province and has suggested reappointing him. British officials have reportedly threatened to withdraw their forces from the province if he is reinstated, seeing this as an attempt to protect narcotics interests in the region rather than a potentially stabilizing move. 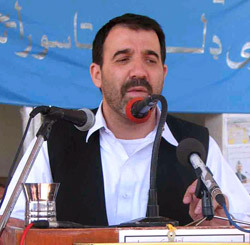 Akhundzada campaigned for Karzai during the 2009 elections and is alleged to have carried out large-scale ballot card fraud in order to boost his tally in Helmand province. Hazrat Ali served as commander of the Hezb-e-Islami Khalis faction during the Soviet invasion. He later fought against the Taliban as commander of the Eastern Alliance—a Pashtun-led coalition of fighters stationed around Tora Bora. When the Taliban collapsed, Ali took control of the city of Jalalabad and the surrounding Nangahar province. His troops helped the United States track down many al-Qaeda members, but Hazrat Ali was accused of allowing Osama Bin Laden to escape from Afghanistan in December 2001 in exchange for money. Ali was appointed police chief of Nangarhar province in 2002 and has served as the military adviser to Karzai for the country’s eastern region. Ali resigned as police chief in 2005, ran in the parliamentary elections, and won a seat in the lower house of parliament. As a member of parliament, Ali has aligned himself with the United National Front. Ali claimed to have disbanded his forces and turned over his weapons prior to election, but officials insist his private army still partakes in land seizures, drug trafficking, and intimidation. Human Rights Watch has accused Ali of sexually assaulting women, detaining critics, looting, and participating in the opium trade.